In Spring 2006, eight enthusiastic eaters banded together to eat local food grown or raised within 100 miles of Kansas City. 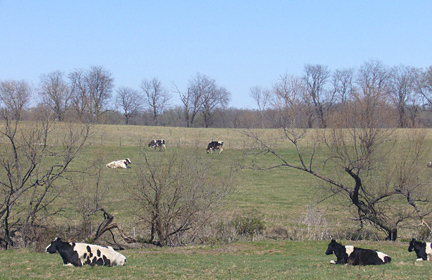 As the KC 100 Mile Diet team, they wrote a ten-month series of articles published in PresentMagazine.com that described their discovery of abundant and numerous sources of local foods. The team compiled their research onto a CD and created a “Users Guide to Local Food” that is available for sale to Kansas Citians interested in eating more food from local sources. In addition to the PresentMagazine.com articles, the CD also includes favorite recipes featuring local ingredients, the KC Food Circle’s 2007 Directory of Local Organic and Free Range Food Producers, and an extensive list of websites and publications about local, organic foods. Above: Beautiful green and brown eggs are dwarfed by the huge goose eggs. Both available through Pinwheel Farm in Lawrence. 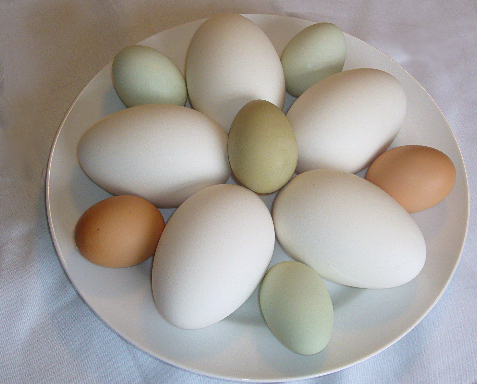 Want some of the most beautifully colored eggs this Easter, but don’t have time to dye them? No problem, just stop by the Pinwheel Farm in Lawrence, Kansas where you can get a mixed dozen of colors from soft, warm brown to light sage, blue-green and olive. The best part? The chickens do all the work. As I roll my cart down the aisle of Whole Foods, I get a twinge of guilt every time something processed and non-local hits the metal grid of the cart bottom. I’m doing my best, but sometimes you need something, well, quick. In our anything but slow lives, Slow Food is not always an option, even if you want it to be. 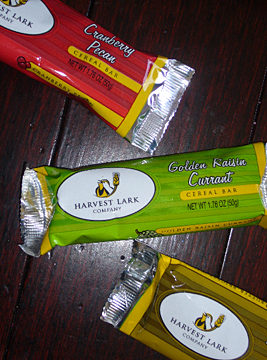 Now, thanks to Harvest Lark, my grab-and-go snack moments can be local, too. Their products, Harvest Lark Cereal Bars and Lark Mix, were created in owner Cheryl Zumbrunn’s kitchen as a healthy snack for her hard-working farm family. The ingredient list reads more like a real recipe instead of a science experiment, and it contains several ingredients sourced locally to Zumbrunn’s farm in Chapman, KS, just 110 miles from Kansas City. Local ingredient make up one-quarter of the bars content and include; hard red winter wheat, hard white wheat, honey, and pecans. While Zumbrunn’s kitchen has had to be replaced with a production kitchen, Harvest Lark products are still made on-site at the farm. The other things that have changed is the recipe for the bars which will change to replace corn syrup with brown rice syrup, and the product line has expanded. The bars come in six flavors; Coco-Espresso, Cranberry Pecan, Raisin Currant, Peanut Butter, Ginger Date, and Chocolate Chip. A box of 8, 1.76 oz.each, costs $8.99. The Lark Mix, a blend of the bar “trimmings” plus nuts and dried fruit, currently comes in one flavor only. An 8.25 oz. Bag costs $4.99. Six flavors of Lark Mix will be introduced in May of 2007. Harvest Lark products are available at Dean and Deluca and To Your Healthy KS in Gardner, and soon, at Whole Foods in Overland Park. You can also purchase the products from the Harvest Lark web site: www.harvestlark.com.